FriendSheep: Jag forsta inte engelska. This course has been designed to be listened to and repeated, but no written material was added, but I have to have the words I pronounce in front of my eyes with pronunciation transcription, so I took my other notebook I bought recently (the one with the flowers on the cover, if that piece of information matters here... ^^), and I put down all the words, using a dictionary. I noticed that with my first knitted sweater (Tomato) I entered a brand new world - I no longer look at the sweaters/tops/cardigans/... and think "Well, nice shape/colour/drape...", I think "What a beauty! I must knit this one day!". Which is terrifying because I would have to exist in several people at the same time in order to knit all sweaters that I liked (and to wear them in one lifetime...). And I'm looking for all the bizarre shapes and solutions, no simple stockinette cardi for me (maybe it's the first OMGs-I-can-knit-sweaters phase?... *^v^*). 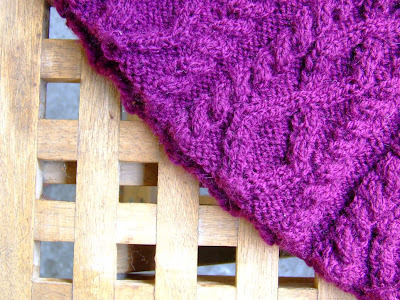 The yarn color for your purple belle is absolutely gorgeous! 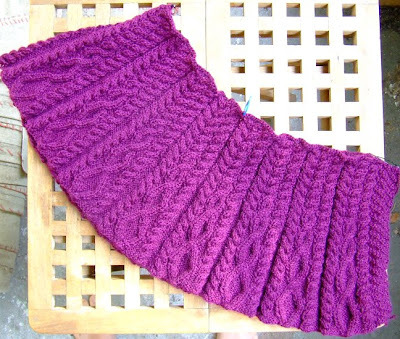 Did you made a swatch before started ,meaning to you have same gauge as in pattern?What size needles you using? I read all your posts about it! Wow!! you just continue to add to you list of languages! but that's awesome! Your sweater is looking great!! Lots of luck with your seaming-i am a horrible seamer as well. i have only made 2 sweaters (one winter one spring/summer) and i ended up starting them in the middle of the season they were meant for and only got to wear them one time before it was time to pack them away. Acutally my winter one was finished in November but our last winter was so mild that i only got to wear it once. 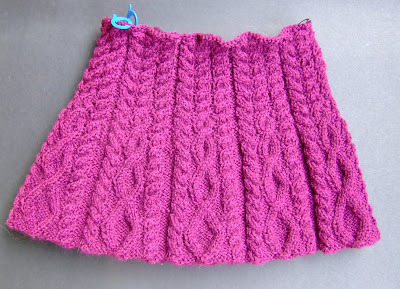 I think you just knit whatever you want whenever but it helps to plan ahead and have it done before the coming season.